Wonder Woman is finally set to arrive in theaters this weekend, and that is a very big deal. Not only is this the first female-led superhero movie of the modern era, but it also has the burden of proving that a great movie can exist within the DC Extended Universe. Well, it looks like you can breathe a huge sigh of relief DC fans, and for that matter, movie fans everywhere, because Wonder Woman is officially a critical hit. 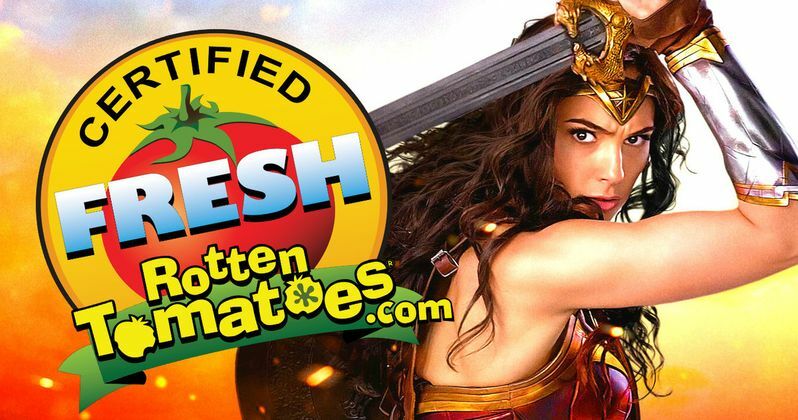 It is now the first DCEU movie to be certified fresh on Rotten Tomatoes, and it is very, very fresh. We have been hearing very positive social media reactions to Wonder Woman over the last week or so, but the real question was how the full reviews were going to look. But Warner Bros. finally lifted the review embargo last night and the verdict is in. As of this writing, with 54 reviews counted, Wonder Woman has a 96 percent approval rating on Rotten Tomatoes, with only two negative reviews counted so far. Here is what our own Julian Roman had to say about the movie in his Wonder Woman movie review. "All doubts are vanquished. Gadot is both ferocious and endearing; innocent, but not naive. Raise your expectations for this film. Wonder Woman is a winner." Much of the praise for Wonder Woman has been given in equal parts to Gal Gadot's performance as the titular DC Comics superhero, as well as director Patty Jenkins. That makes the critical success of Wonder Woman an even bigger deal, since this is a bonafide summer blockbuster that was directed by a woman with a woman in the lead role. At a time when Hollywood is struggling to find a balance with equality, this is a huge win. No doubt, this should help pave the way for more female directors and more female-driven, big-budget movies. Assuming box office success follows, that is. Box office tracking has been pretty unreliable in recent years for some big movies, and in the case of Wonder Woman, it has been pretty hard to pin down, with estimates for its opening weekend varying greatly. However, with the reviews coming in overwhelmingly positive, it seems likely that will help give the opening weekend a serious boost. If audiences respond to it as well as critics have, which also seems likely, Warner Bros. looks to have a monumental, well-rounded hit on their hands. In terms of how the other DCEU movies tack up critically, the next closest, critically speaking, is Man of Steel, which is currently sitting at a pretty poor 55 percent approval rating on Rotten Tomatoes. Both Batman V Superman: Dawn of Justice and Suicide Squad are much worse off, with 28 percent and 25 percent respectively. However, it remains to be seen if Wonder Woman can pull in the kind of box office take that those movies did, despite their poor critical reception. Man of Steel made $668 million worldwide and Batman V Superman: Dawn of Justice made $873 million. If Wonder Woman can make somewhere between those two, Warner Bros. should be quite happy. But the important thing is that those who have been looking forward to seeing Diana Prince on the big screen for a very long time are probably not going to be disappointed. It looks like DC finally got it right.